For the best in kitchen waste disposal units, you need a brand that specializes in precisely that; fortunately, Waste King is here for you. They provide only the highest quality garbage disposal units, hot water tanks, splash guards, and more, making your kitchen more useful than ever before. Even better, with Waste King disposals you get a top of the line product that will last for years, eliminating your future need to replace it. 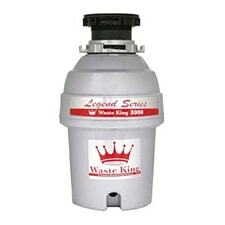 Don't forget, we have a huge selection of Waste King disposal parts, too. 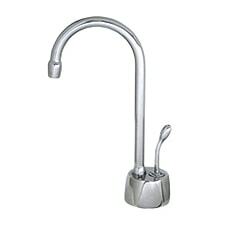 Don't forget about Waste King hot water dispensers which are very popular. Their commitment to quality is backed by the longest in-home warranties around, making this one of the best purchases you could make for your kitchen. Horsepower: Horsepower is a major component to keep in mind when purchasing your Waste King Disposal unit, so you must understand what is appropriate. Do you work in a professional kitchen or some other industrial locale where heavy duty waste will be traveling through the pipes? Then you may need to get a higher horsepower so it can deal. But, if you are just purchasing one for your at-home kitchen, a smaller disposal will cause less noise and should work just fine. 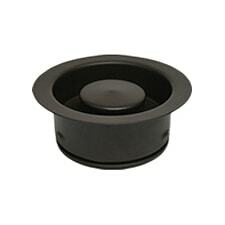 Noise Level: Though most newer garbage disposals offer relatively quiet operation, the cheaper the product, typically the louder it will be. That stays true here with Waste King disposals. If you don't mind a louder product, stick to the cheaper end of our selection; however, we'd suggest going high end if you want to have a quiet and tidy kitchen! Continuous or Batch Feed: Continuous feed garbage disposals are the most common disposal units, where you simply drop the food down the open drain and turn on and off with a wall switch. On the other hand, a batch feed disposal makes you physically feed the waste into a hopper before closing it and letting it run. These are more expensive but are very useful if you hate dropping important objects down the drain. But, unless that's a big deal for you, we would suggest continuous feed disposal units. In addition to waste disposal, PlumbersStock.com and Waste King offer a variety of different kitchen implements to make your kitchen run smoothly. These include Waste King hot water dispensers, connector kits, water tanks, drain elbows, stoppers, filter tanks, and much, much more. Truly, with all these products and the highest quality garbage disposals on the market, they are industry leaders in kitchen technology. 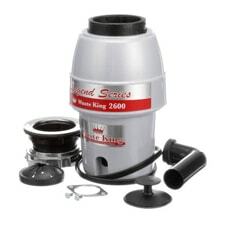 If you are looking for a great garbage disposal unit, PlumbersStock.com and Waste King have precisely what you are looking for, and at a swell price. And, because we have one of the widest selections of plumbing and kitchen implements around, you won't even have to shop anywhere else; we have all the garbage disposal parts you need right here, at PlumbersStock. Call today for more information all brands of kitchen sink garbage disposals! Learn more at WasteKing.com.